Cut the baguette bread at an angle (diagonal) and spread a bit of butter over each slice. Then add a generous amount of grated Gruyere over each portion. Bake the slices for a few minutes until the cheese begins to melt. 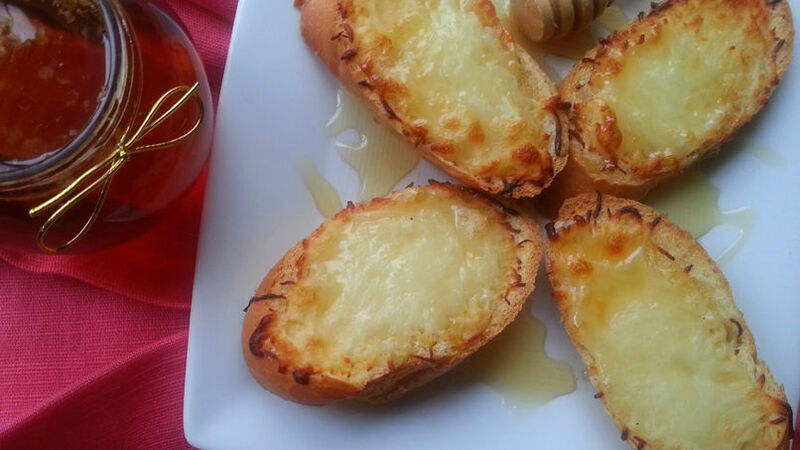 Serve hot out of the oven, with a drizzle of honey on top. This combination will be perfect for accompanying your café con leche in the morning. You can also use Cuban bread (resembles French bread) or the Mexican variety, bolillo if you wish. Gruyere cheese can be substituted for Manchego or Monterrey Jack in this recipe. Breakfast is one of my favorite meals of the day, but I don’t always like to serve the ‘traditional’ eggs and toast. I have a new alternative to share with you-it’s an easy recipe, with a savory-sweet touch that makes a great pair with coffee of tea. Let’s cook!